Configure drives, controllers and operator stations. Design and build complete systems of any size or complexity. Network and operate drives and systems over Ethernet. Provide multi-user, system wide access from anywhere. 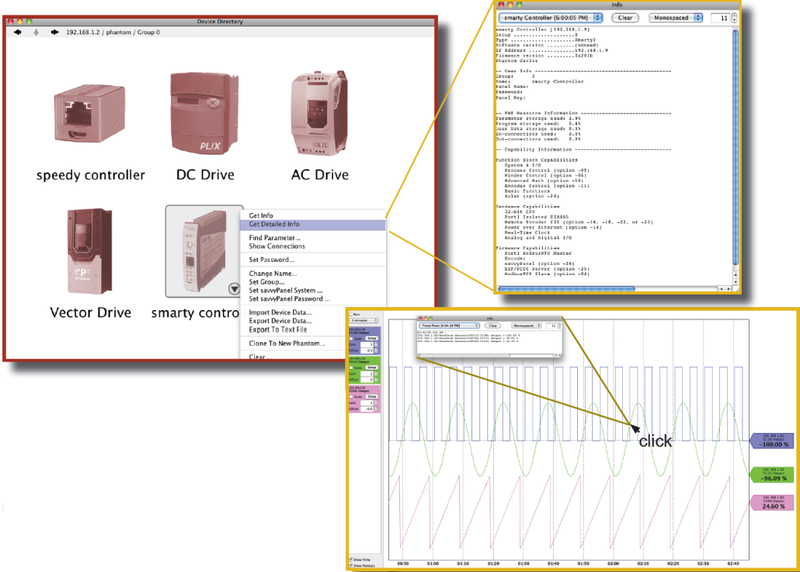 In complex products with a fixed set of features, such as drives, an “Engineering Info” window gives a organized overview of the key parameters, i/o and control features. Simply click on any function button to drill down into the detailed graphical function block and view or change parameter values. 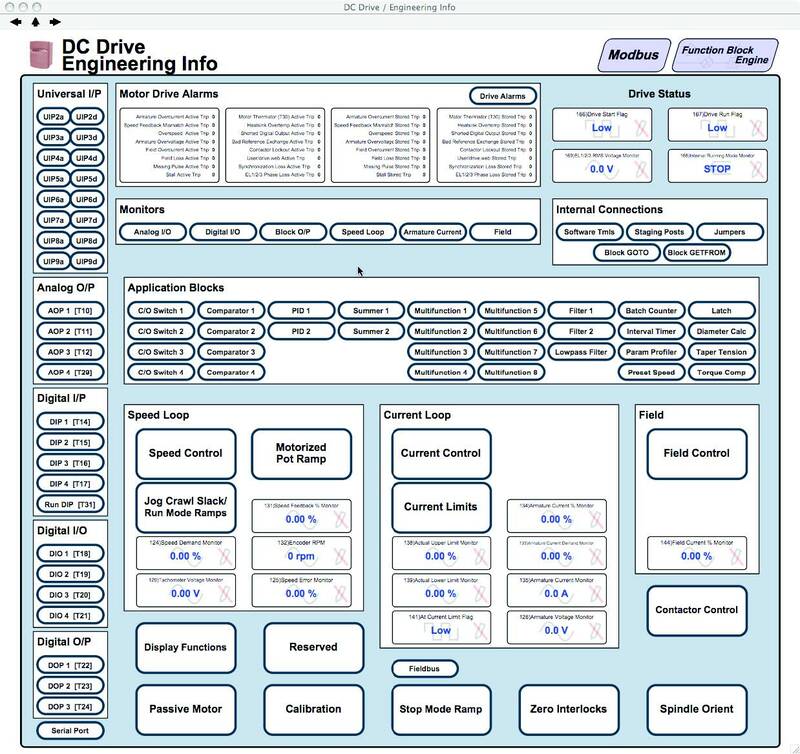 Online or offline design of drive systems using intuitive tools with pre-engineered function blocks. Internet access to drives and systems for remote configuration, monitoring and process training. Provides easy import, export and cloning of device configurations. Dynamic graphics show real time state of switches, indicators, parameter values, etc. Low cost, full featured, Distributed Control capability with peer-to-peer networking. Multiple users, local or remote, can have concurrent real-time access to drives or systems. Function Block Libraries for winder controls, PID, drive synchronization, arithmetic, logic, etc. Deterministic connections provide high performance links between drives, PLCs, Operator Stations, SCADA computers and other control products. “drag & drop” techniques make easy parameter connections between drives, control devices, etc. “Dock” feature enables key system parameters to be monitored and trended from one location. Powerful navigation features include drill down into detail layers in drives and controllers, search, connection tags, jump, browse, pan and zoom for easy visual system comprehension. VPN (Virtual Private Networking) for secure Internet connectivity is supported. Password protection is provided at many levels for secure use. Anywhere in the system you will have easy instant access to the information you need with several different types of resource. Right-click on any active object such as a device, connection, parameter or function block to open the contextual menu. “Hover” over any active object and see its key data appear at the top of the window. “Hover” over a button to see its function described. The “Help” menu links you to the full user manual, and other getting started guides. Look out for the information button. This will jump you to the relevant location in the user manual. You can collect any parameters of interest in a “dock” window and display as a trend chart. The trend time scale can be adjusted from 10 seconds to 2 days and the data can be exported in a .csv format for separate spreadsheet analysis. Click on a point of interest to get the instantaneous, time stamped data values.